There’s a reason there are so many garage sales this time of year. As folks begin to do their annual spring cleaning, they discover that they have so much stuff that they’re starting to run out of actual living space. So, they round up the sale flyers, tiny price stickers and all the change they can find, and start clearing out whatever isn’t absolutely necessary. But what happens when you don’t really want or need to get rid of the things that are taking up so much room? What if you are just simply expanding beyond your current living area? It does happen. And while it would be nice to buy a bigger house, the reality is that it may not be an option. Instead of forcing yourself to get rid of things you really do need or want, why not consider some unique storage options? True, you may not need your grandmother’s handmade quilt for daily use, but that doesn’t mean you need to give it away in order to save space. Let us offer four tips to help you take back some space without sacrificing your stuff. Think vertically. Take a look at all that wonderful space that is above your cabinets, at the higher levels of your living rooms and offices, and even the top spaces of your closets and pantries. There’s plenty of room at the top! And with a little ingenuity and creativity, you can leverage that to your advantage. Put it in hiding. Nowadays, many furniture items come with hidden storage compartments that are perfect for blankets, books, clothes, toys and more. We recommend storage ottomans, which can be purchased at any number of everyday stores like Target and Walmart. Hang it up. Beyond just adding higher shelves, consider all that your ceiling has to offer, especially in kitchens and garages. In your kitchen, you can store pots and pans on hanging racks in a way that not only adds extra space, but also creates a charming atmosphere. In the garage, specialty storage designers can actually create a storage unit for your entire space that includes the ceiling. Contact your local cabinetry company for ideas and options. Rent it out. If all else fails, don’t give up hope! There are many affordable rental storage options to choose from that are both safe and easy to access. From small PODs to entire storage units, you can safely tuck away your items until the day when you are able to afford that move to a bigger place. Don’t trust the rental companies? Ask a friend with an unfinished basement if you can rent a room for a small fee and keep your extra boxes in a familiar space. While purging your house of unnecessary clutter is usually a good idea, forcing yourself to get rid of important items is not. Your family will treasure your grandma’s quilt for generations, and you’ll be so glad you created the space for it in your home. So, don’t get packin, get crackin! 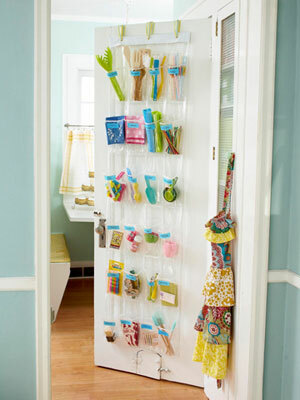 Find the hidden storage options in your home that are just waiting to be put to good use. We’re betting you probably won’t have to look far at all.